And still they come. An apparently endless flotilla of rubber dinghies filled with migrants and refugees making their way across the Mediterranean to Europe. As the numbers and visibility of this migration have gathered pace, even mainstream politicians have expressed their alarm. Antonio Tajani, president of the European Parliament, has talked of an exodus of biblical proportions. Solutions designed for a few thousand people will not work as a strategy for millions, he warned. In responsible political circles, let alone in the more feverish popular media, there is an increasing recognition that the three conventional “durable solutions” to displacement – local integration, resettlement and return – cannot meet the scale and speed of the movement of people. The international institutional architecture seems unequal to the task. In 2016, there were no fewer than seven international summits to address the refugee and migrant “crisis”. What is talked about is often a reboot of what has demonstrably failed before. Emerging, sometimes from unexpected places, have come a number of imaginative solutions. For example, the proposal to create a separate “refugee nation” was first promoted by a Californian businessman, Jason Buzi. Egyptian telecoms billionaire Naguib Sawiris has also sought to buy an island from Greece or Italy to house those crossing the Mediterranean. The most elaborately worked-out island solution is to create a “Europe-in-Africa” city-state on the Tunisian Plateau – a thin strip of seabed that sits between Tunisia and Italy within the Mediterranean. The concept has been modelled in detail by Theo Deutinger, a respected Dutch architect. Other proposals have centred on the creation of “refugee cities” or zones. Drawing from the example of a special economic zone in Jordan near the Za’atari refugee camp, where refugees have been allowed to work rather than languish, migration expert Alex Betts and economist Paul Collier have made the simple but daring point that many refugees can be turned into assets rather than liabilities if the legalities forbidding asylum-seekers seeking paid jobs are set aside. My colleague Nicholas Van Hear and I have reviewed most of these proposals and advanced an even more radical plan. Our vision is to create a set of loosely-connected self-governing units we call “Refugia”, brought into being mainly by refugees and displaced people themselves, with some support from sympathisers. Though scattered like an archipelago, Refugia will nonetheless link together many refugee communities – in conflict areas, in neighbouring or transit countries, and in more distant countries of settlement. We are happy to accept the label “utopian” for our scheme, but ours is a more pragmatic idea, a “realistic utopianism” to use a term developed by the philosopher John Rawls. We see Refugia as the outcome of a tacit grand bargain – among richer states and emerging countries, nearby countries affected by conflict and, crucially, refugees themselves. After discussions with representatives of Refugia, new constituent zones will be licensed by the nation states within whose territories they lie. Refugee camps, hostels, farming communities, self-built housing estates or suburbs of a town might all join Refugia. Though subject to the host states’ laws, zones are created from below. They are self-governing and eventually self-supporting. The upshot is that Refugians hold dual affinities: as well as an affiliation to Refugia they can be long-term residents of the states that license their territories. They can move among different parts of Refugia, and, where negotiated, between sovereign nations. Refugians will be issued with a “Sesame Pass”, a super-smart, biometric card that opens up and connects all the nodes and zones of Refugia. This will provide those who have it with a collective identity, the right to vote for a transnational parliament, legal status, entitlements and the facilitation of work, financial transfers and enhanced mobility. 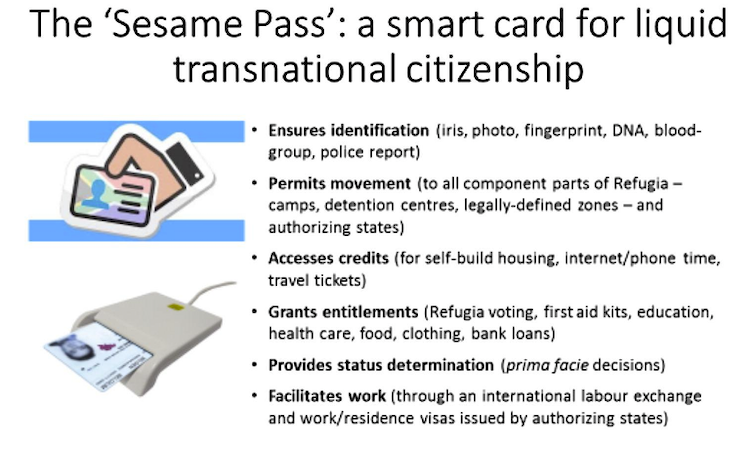 The Sesame Pass could also be developed as a machine-readable currency, which will allow tax collection or the administration of a basic income grant for all Refugians. There is some sense in which an embryonic form of Refugia already exists. As the length of time in refugee camps has lengthened and more refugees have been accommodated in or near cities, organic urban settlements have developed. A good example is Camp Domiz, a Syrian refugee camp in northern Iraq that has been badged a “Refugee republic”, as its inhabitants have set up community centres, shops and mosques. In our vision, Refugia is essentially self-organised and self-managed. It does not require political or cultural conformity, rather it subscribes to the principles and deeds of solidarity and mutual aid. But it is absolutely possible that desperation might drive the European Union to come up with a radical blueprint for a dystopian form of Refugia, which does not fit these principles. In September 2016, Hungary’s right-wing prime minister Victor Orban suggested that the EU should build a “refugee city” in North Africa. Not only was this explicitly about repression enforced by military might, Orban also declared that “those who came [to Europe] illegally must be rounded up and shipped out”. While we must be on the guard for forms of Refugia that are nakedly about subjugation, new territorial units initiated from above should not be discarded in principle. There is no reason why, where these proposals comply with Refugia’s democratic and tolerant values, they should not be incorporated as nodes within the wider idea. Precisely because they have been disempowered by their traumatic experiences, those who have been displaced do not need things done to them and may even resist things being done for them. Ideally, Refugians will be in charge of as much of Refugia as is practically possible. This is the promise of the many small initiatives and inventive new solutions in this utopian vision of what could be possible. 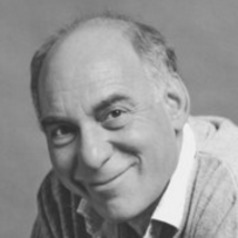 Robin Cohen does not work for, consult, own shares in or receive funding from any company or organization that would benefit from this article, and has disclosed no relevant affiliations beyond the academic appointment above.